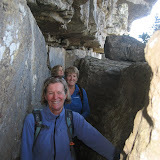 Table Mountain Trail van Vuuren family, a set on Flickr. 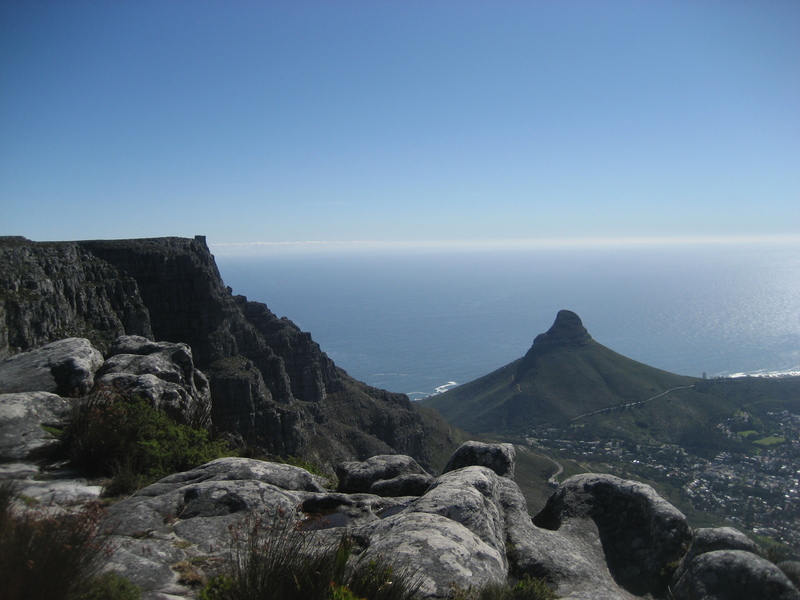 Johan had been planning this pre-Christmas Table Mountain Trail overnight hiking trip since the beginning of May this year, so when the day finally arrived it felt as if I already knew the family well. 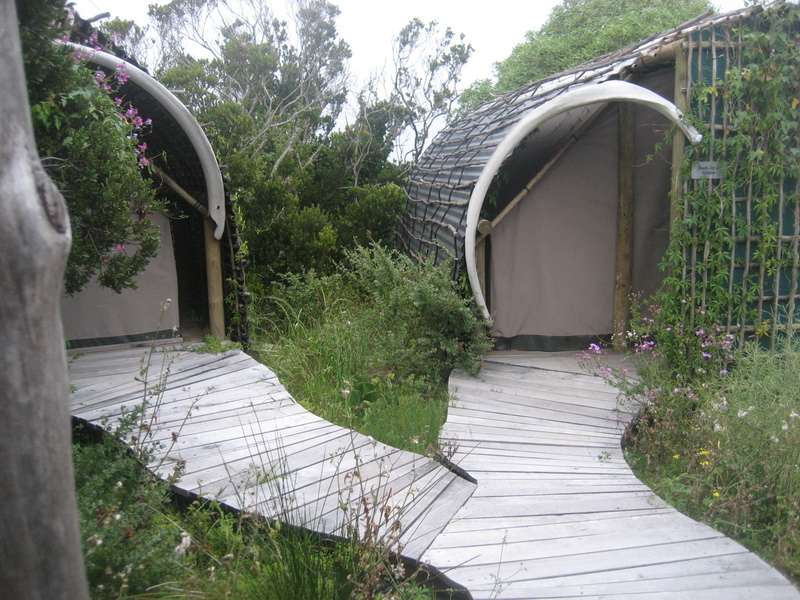 The original plan was to start at Kirstenbosch Botanical Gardens and take the reasonably easy route up Skeleton Gorge to Smuts Track and the cottage. The prediction of rain for the 24th however, dictated a rethink, as hiking in the rain would have meant missing out on the views from the top of the mountain. 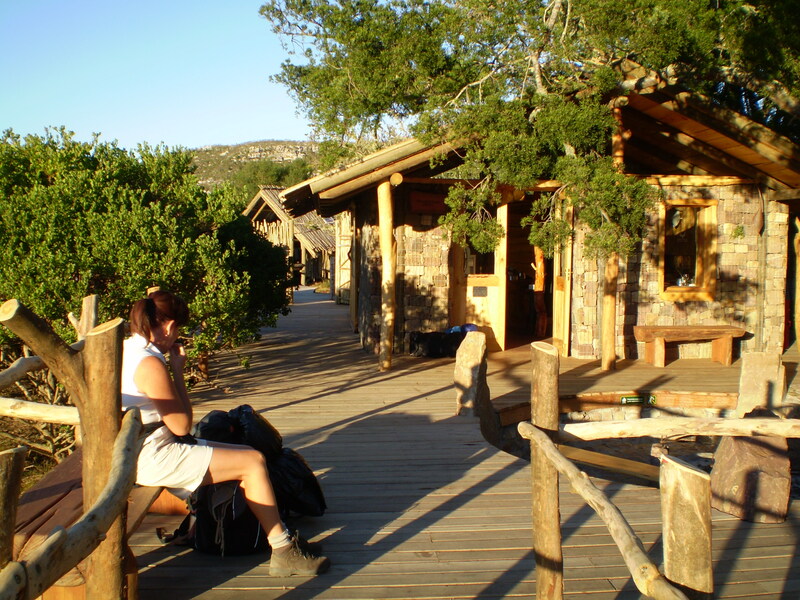 The alternative was to start at Table Mountain cable station and do the trail in the opposite direction, either using the cable car to get to the top or to take the steep walking route up Platteklip Gorge. I was quite impressed when they all made the decision to tackle the ‘Gorge’. 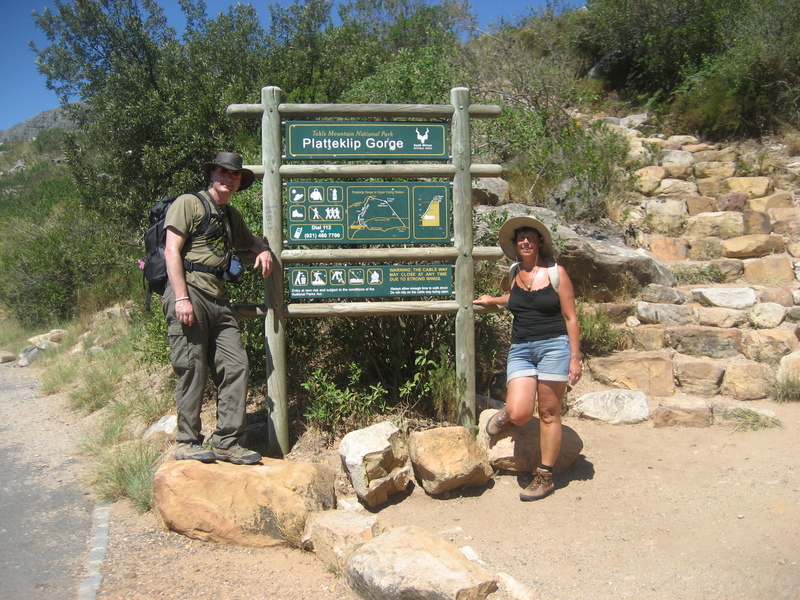 The climb up Platteklip Gorge covers a distance of about 2 km in the ascent of the zig-zag path, from just over 300 metres on Tafelberg Rd. to just over 1000 metres at the top. For those not used to this type of walking it can be quite a challenge, particularly on a hot day. The day was one of the hotter days we had experienced this summer, so it was never going to be easy. The girls were up for it and ready to set the pace, but the adults took it slow and steady, particularly as we got higher up the slope, where patches of shade are scarce. Nevertheless, with plenty of stops to ‘admire the view’, take photographs and to make sure hydration levels were maintained, everyone made it. The biggest mistake that is made on this route is not taking enough water. Once at the top we headed to the restaurant near the cable station, for a welcome cold drink, plenty of ice and recovery, ready for the easier, but longer trek across the mountain to Maclears Beacon and eventually, the Overseers Cottage. Leaving at about 1 pm., we retraced our steps to the beacon on Platteklip Gorge and then across the flat plain to the highest point. From here, we caught a glimpse of Overseers Cottage, our overnight accommodation, tantalizingly in the distance. 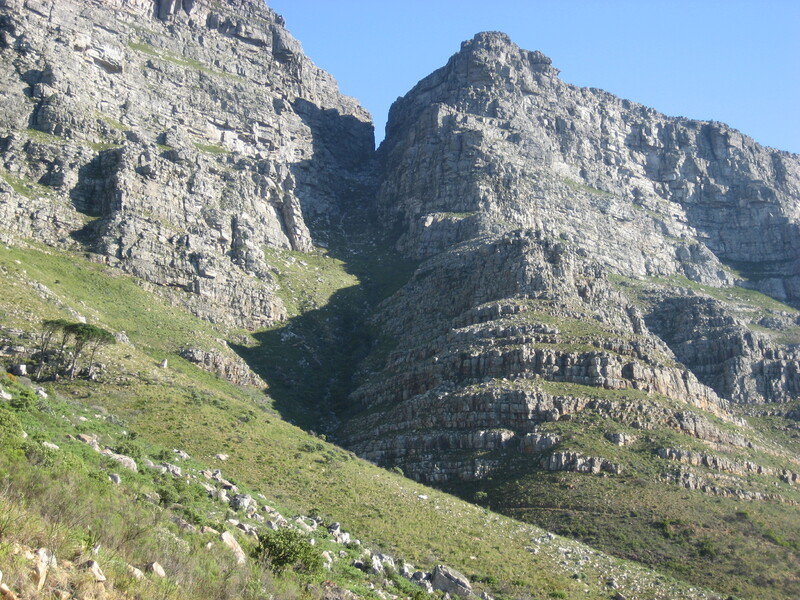 The feature of this route is the ever changing views, and after Maclear’s Beacon the ever changing terrain along Smuts Track (named after the war time Prime Minister of South Africa, who was himself a keen mountain hiker). 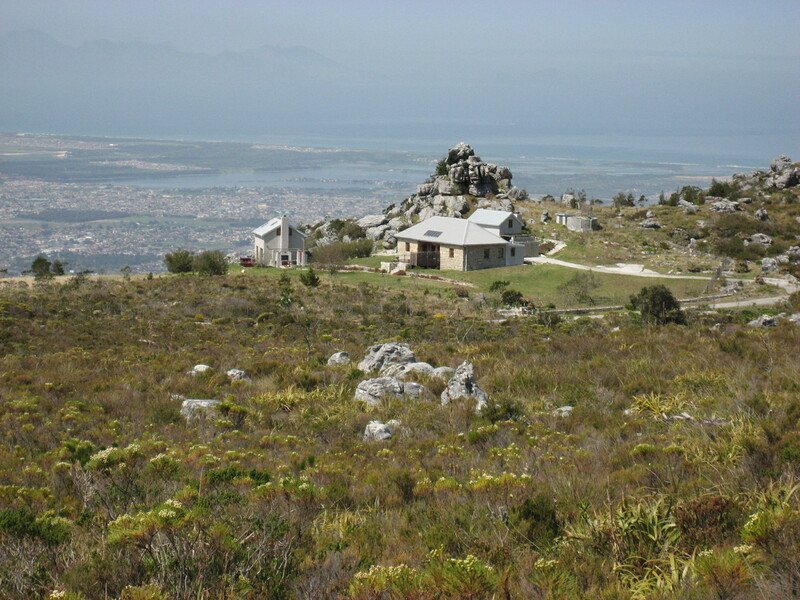 Quite soon after leaving Maclear’s Beacon, the outlook shifts from one of Table Bay to the north, to one of the Southern Suburbs of Cape Town, the Cape Flats and False Bay to the east and Hout Bay and the Back Table of the Mountain to the west. 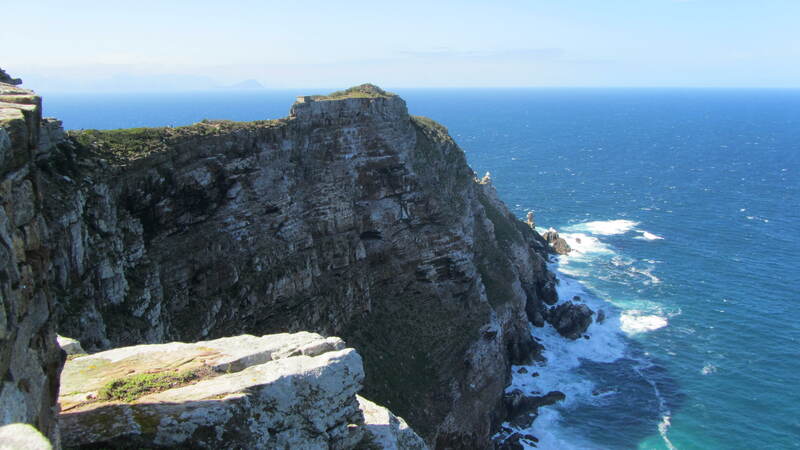 To the south, hidden behind the mountains above Simonstown, is Cape Point. On a good day, this has to be one of the most spectacular trekking routes in the world. Adel was struggling with sore feet, so going was slow, but who needs to hurry with views like this and when you are in part of the most diverse floral kingdom in the world. The view of the cottage disappeared as we headed down to the valley above Window Gorge, past Echo Valley and the Aquaduct. Some of us took a short diversion in to the Aquaduct to view the beautiful, delicate drip disas sprouting improbably from the rock face. Then it was off to the top of Skeleton Gorge and Nursery Ravine before finally coming out of Ash Valley to see the Cottage in front of us again, almost within touching distance now. This was a welcome site and the girls rushed ahead to reach the comfort of getting the shoes off and having a shower. By the time the rest of us got there they were already looking relaxed and refreshed. Vicky was there with the basic meal preparation already complete and it remained only for me to get the fire going for the evening braai. Once Adel got her shoes off the cause of the sore feet was revealed in a huge blister on the big toe. My admiration for her increased immensely, that must have been very sore to walk with. 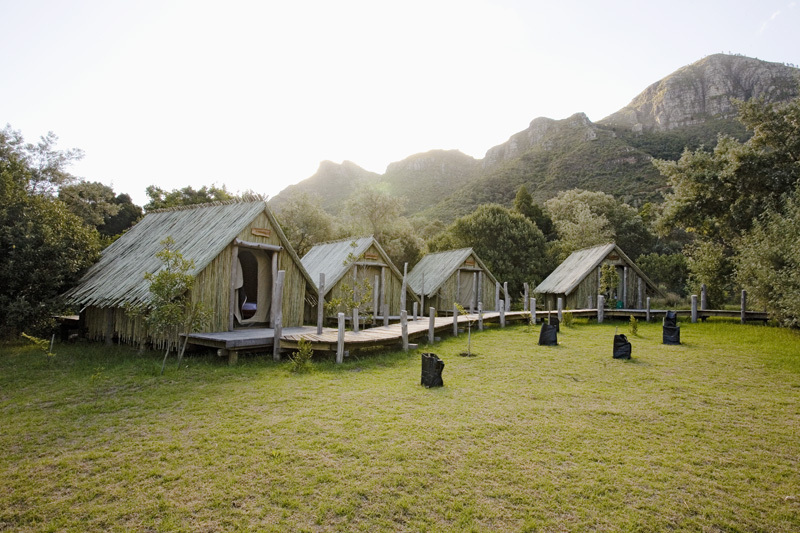 As is usual in this cosy cottage, once the feet are up and drinks in hand, the memory of the painful feet and sore muscles fades, while the magic of the environment and walking in this very special part of Table Mountain and the Cape Floral Kingdom remains. The tradition of the South African braai, stimulates interesting conversation and creates friendships and this night was no different. With rain predicted for the morning and thoughts of further exploring of the Back Table banished for the moment, there were some tired bodies that hit the beds that night, looking forward to reasonably late sleep in. During the night the wind came up and by the time we woke there was plenty of cloud about, vindicating the decision to walk the trail in reverse. At times it looked as if the rain would pass us by and then suddenly the cloud would be all around and a rain squall would set in, before moving on again, leaving light mist and views of the cloud bank below. After a bit of lie in, breakfast was ready. 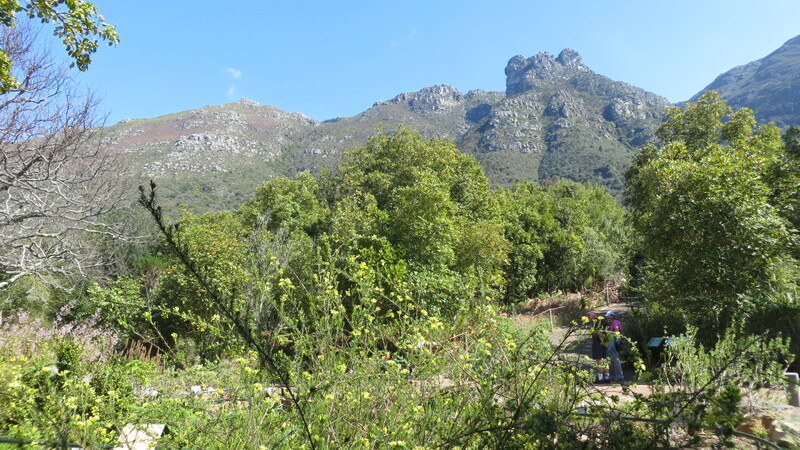 Over breakfast, the decision was made that Adel and Nina would go with Vicky down the shortest route to Constania Nek and the car, while I would take Johan and the other two girls down via Cecelia Forest to the finish in Kirstenbosch Botanical Gardens. Fortunately the rain had more or less passed over by this time and we had a dry walk down to meet Vicky and the others in the Gardens. Johan treated us all to a wonderful end of hike lunch at the Forresters Arms. A fitting finish for a superb two day trail. I feel very privileged to be able to lead such diverse and interesting people on trails in this part of the world. 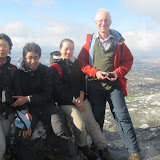 Table Mountain overnight trek – July 2012, a set on Flickr. 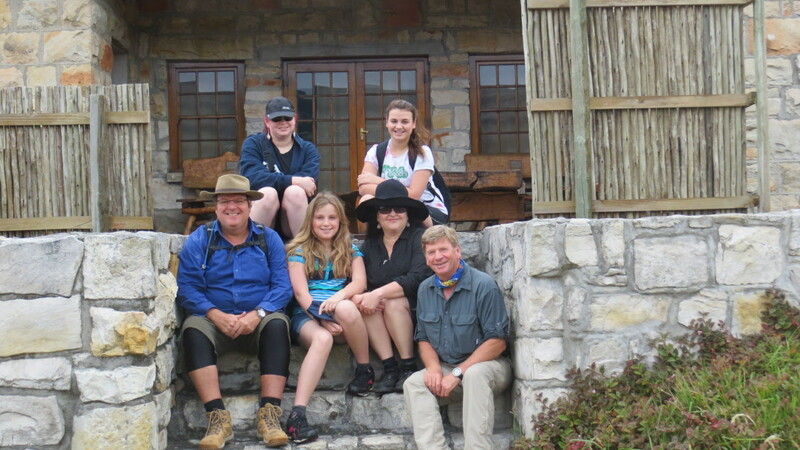 The Bauer family on an overnight trek on Table Mountain. 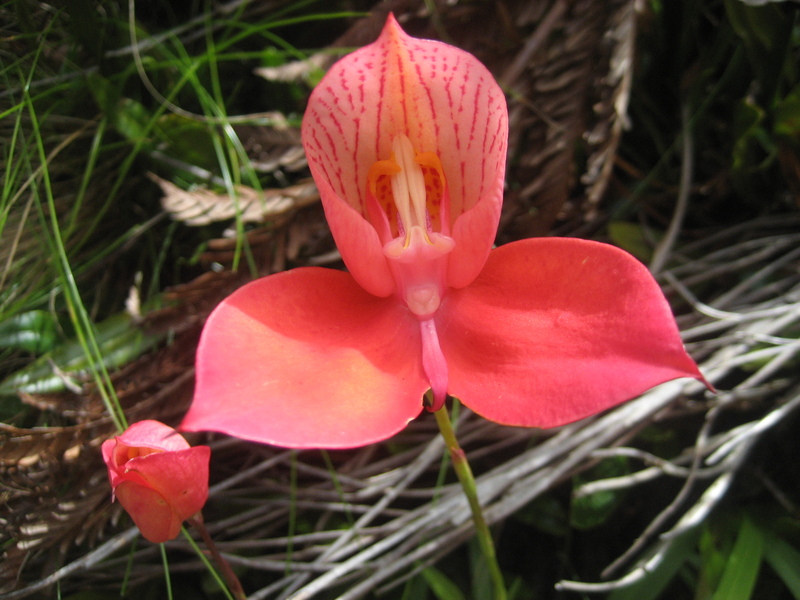 Starting in the Kirstenbosch Botanical Gardens, we hiked up to the Overseers Cottage. There was a bit of rain about, so we dried out and had lunch before setting off to explore the Back Table of the Mountain. The rain was sufficiently light not to deter us and we were lucky enough that the mist cleared over Kasteelspoort to give us a view over the Atlantic Ocean and Camps Bay. The younger family members took the jeep track back to the cottage while the rest of us hiked through Nursery Ravine path and on to Smuts Track. Back at the Cottage, after a bit of a struggle we managed to get the fire going and warmed up quickly. That evening we had a nice hot mixed ‘potjiekos’ for dinner with couscous and vegetable bake accommpanied by a nice bottle of Wolftrap red wine. Malva Pudding finished off the dinner. The next morning the rain had cleared away, although the cloud sat over most of the city for the whole day. We were above the cloud, making for a magnificent view. There were a few detours to look at views (over Orangekloof) and the interesting ‘beach’ on Skeleton Gorge. After lunch we arrived at Maclears Beacon, the highest point of the Mountain, at 1084 metres. Then it was on to the cable station for a quick look around at the 360 degree views of the City of Cape Town and the Cape Peninsula, before the trek down Platteklip Gorge and the end of the Trail. 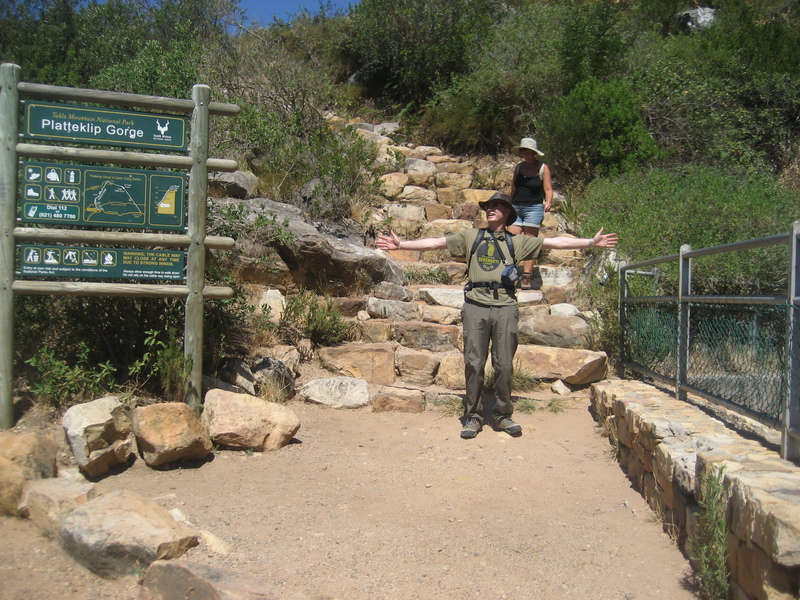 This is a write up of the section of the Hoerikwaggo Trail between Simonstown and Smitswinkel Bay. 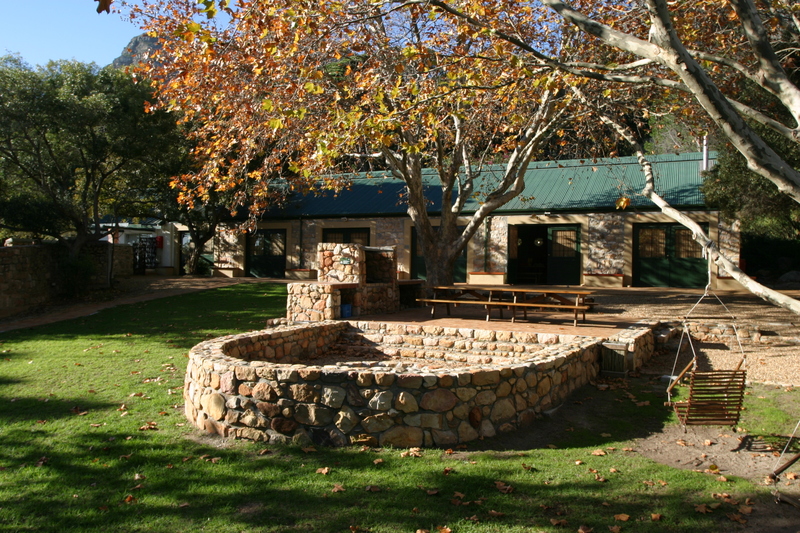 It is not included in the official trail as there is no SANParks managed accommodation in the Simonstown area. 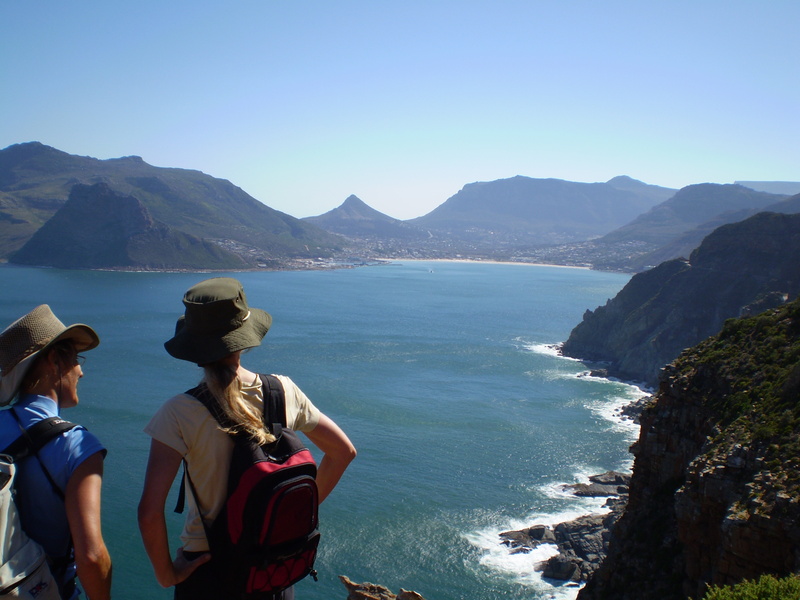 On the official brochure it is the section between Smitswinkel Bay and Simonstown where transport is required. Nevertheless it is a stunning section of the hiking trail and the natural link between the two points. 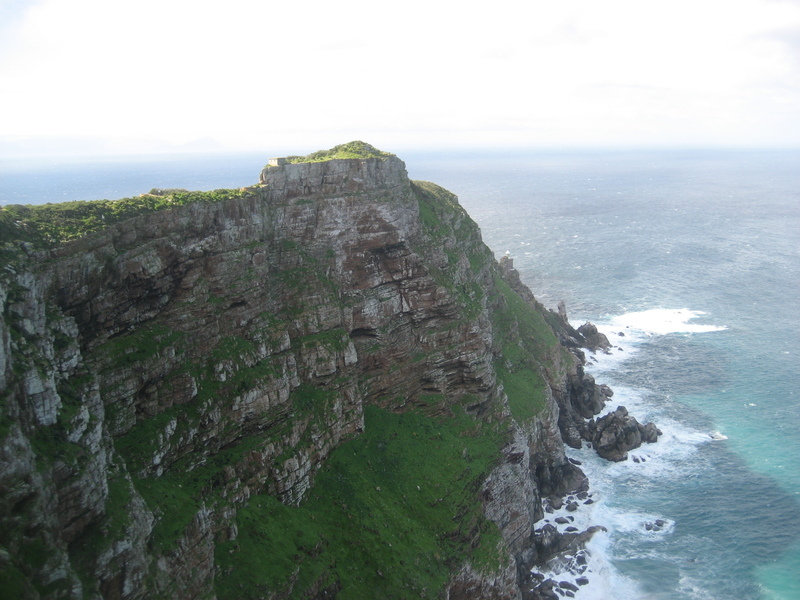 It is challenging trek, particularly starting from Smitswinkel Bay, with a steep walk up the ridge. We did this awesome route on Saturday with Meridian Hiking Club. 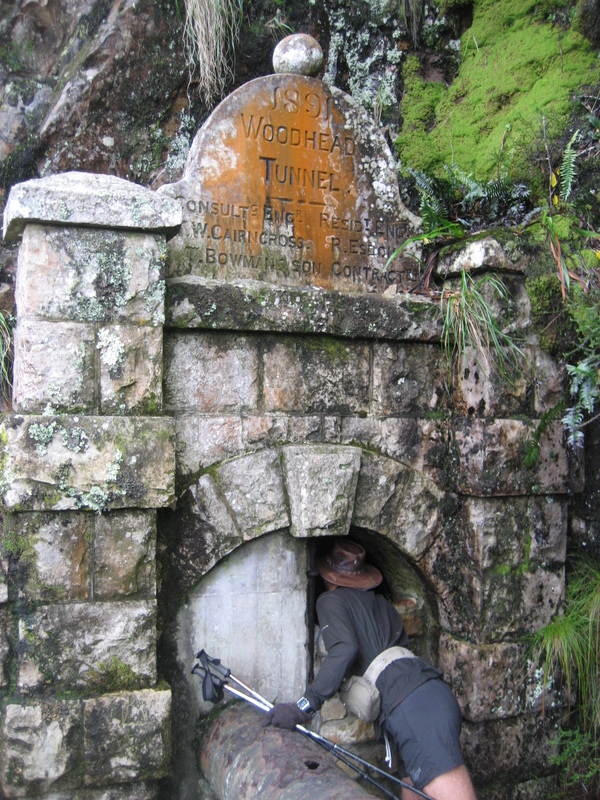 We left early from Constantia Nek to join Karen and he hiking club group that had spent the night at Overseers Cottage. I had done it about three or four years ago with Tim Jenkins, but when I tried to explore the route last year with a couple of friends we ended up at the Hole in the Wall and came back through the hidden forest. That was quite an adventure in itself. It was therefore good to do it with Karen, who knows the route well and also showed us how it links with the Hole in theWall Route. The views over Orangekloof are wonderful and scrambling behind the rock faces is quite interesting and surprising in places. There are some slightly exposed paths around the front of the ledge, but in most instances there are alternative routes around the back, where gaps open up unexpectedly in front of you. In some cases you have to look for the entry points and squeeze into places that look a bit inaccessible. Although narrow in places they are easy to get through once you see the route. There are impressive sandstone cliffs above you with some protruding rock overhangs all the way along the route – hence it’s name. The path is clear in most places, but not always. It is essential to do the route with someone who knows the way. 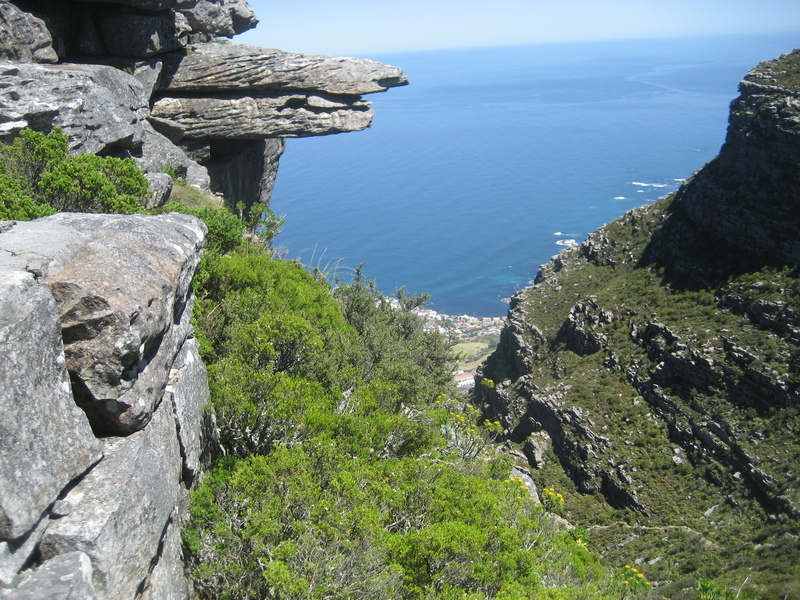 We had tea at the end of the ‘Overhang’ trail, enjoying looking down into Orangekloof and overHoutBay. The path to the top of the ridge and then down into the valley below is not clear and you really have to look for thecairns. Once in the valley, the path links back to the concrete road and Overseers Cottage around the corner.